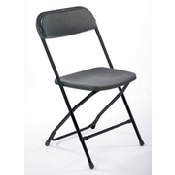 Charlotte Party Rentals Black Folding Chair is perfect for any party or event. These chairs are extremely stable, they hold up to 250 pounds per chair. Other Fee: When renting Chairs there is an $95 Delivery Fee, if not rented with Tents or Inflatables. There is an additional charge for Chairs Setup, $0.50/chair as setup & takedown fee.